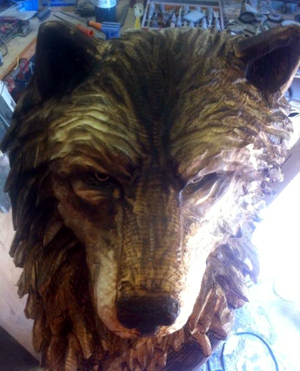 This dramatic carving stands about 6′ tall and features the stern head of a wolf, with dark low lights and the natural white pine showing through in the highlights. Sara carved this in her shop for a client. I have been trying to reach you. We purchased an owl from you at a demonstration last summer and wanted to purchase and eagle – can you contact me?